The sun came out today after two chilly, rainy days. The warmth inspired the flowers to show off these last few days of summer. 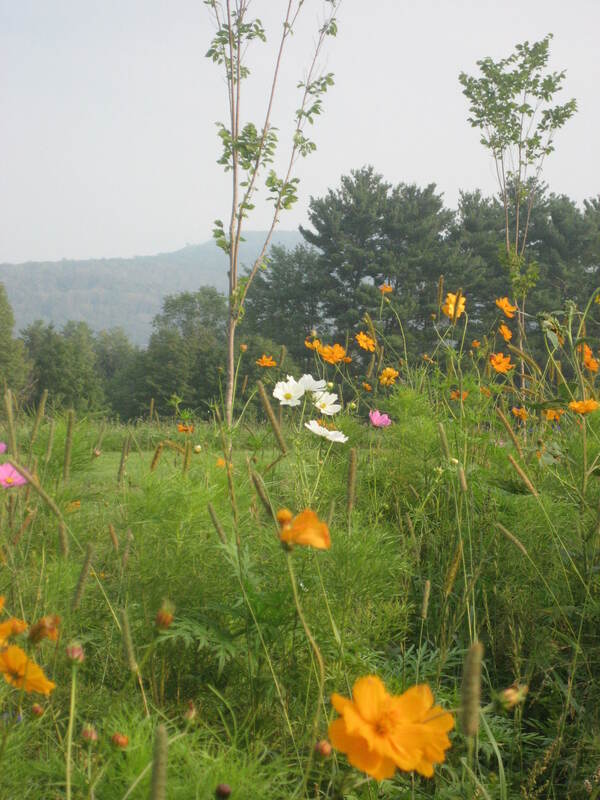 There were delicate cosmos in orange and pink and white, some few remaining blue bachelor buttons, sunflowers, and a lone poppy stuck his crimson head out in chorus. In the fields, my favorite for wild flowers, there was purple clover and small, white daisies mixed among the plantain. Plantain stalks stirred in the breeze and furry plantain made handy landings for the insects. Small yellow butterflies danced in a helix, rising above the green like a fountain. Along the edges of the woods were tall golden rod, leaning over, heavy with flowers. Dragonflies, butterflies and dirt-brown grasshoppers were everywhere. Mosquitoes too. I walked on a trail for a while, until I heard the sound of crunching and breaking wood — with a heaviness that signaled, at least to me — that whatever it was or whomever it was — was my size or bigger. I split after that and walked on the more travelled path. I could feel the heat coming off the ground and the sun on my neck, but knew it was fleeting. It would soon turn cold. Some maples were already displaying red and orange and gold. The days are shortening, shorter and shorter, dwindling down the hours of sun as the yin begins to stretch out and embrace the season. I loved my summer; nights with Kevin at the ocean or in bed in his arms. Waking up naked and happy and safe in our world. Showering and drying off, lying side-by-side and breathing in and letting go.’Tis the season of letting go — the trees and flowers and bees tell me so as I walk along the way. I talk back to them all — cooing and aaaahing at their magnificence. We all know nothing lasts. But we take refuge in the cycle. The season of endings gives way to the season of beginnings. The yin will grow and surround our world and plunge us into the midnight of winter, and the yang will creep up slowly in the heart of darkness, with tendrils of light to awaken the world and inspire newness. That nothing lasts is our pain and our blessing. Tears make way for joy, love makes way for loss and death makes way for life. This is our world.